We regularly hold open auditions for our productions. Our auditions are open to everyone so please come along and join us. You never know, it may be your turn to tread the boards here at TLT. You never know what you can do if you don't come along and try. We know that there is an untapped wealth of talent in the Tyldesley and surrounding areas and we are always looking for new members, either to act on stage or do any of the jobs that need to be done in theatres ..... but on a smaller scale!!! This is a great way to meet new people and do something really good for the local community. Come along and join us. WINNIE BEATTY - 12th May 1941 - 2nd May 2018. 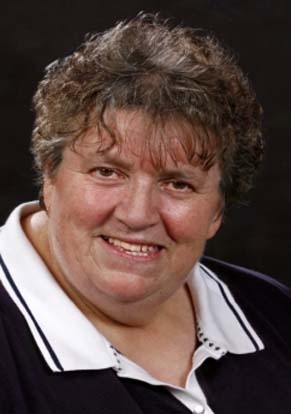 TLT is sad to announce the death of theatre stalwart, Winnie Beatty. Winnie had been ill for some time and passed away on 2nd May. Winnie was a member of Tyldesley Little Theatre for about 40 years. She took on many stage roles in that period and was renowned for her superb comic timing, along with serious roles. In 2013 she won the Bolton Amateur Theatre Societies’ award for ‘Best Actress in a Comedy’ and was runner-up for the Greater Manchester Drama Federation’s award for ‘Best Supporting Actress’ for her role of Mrs Morris, in ‘A Night on the Tiles’. In his BATS review for the Bolton News, Paul Cohen said, “It was Winnie Beatty as nosy neighbour Mrs Morris who provided us with non-stop laugh out loud moments. This was a tour de force of excellent comedy which had timing, facial expression and delivery. Winnie never fails to deliver where comedy is concerned and each line was a gem – her performance while she was arranging to buy family planning comestibles was brilliant”. It is a poignant note that she took the role of the mother in our production of ‘And a Nightingale Sang’ back in 1994. In addition to her work on the stage, she spent many hours backstage as the production prompt and many times in rehearsals had a larger part than the cast on stage!! She spent many hours coaching individual members. She was a member of the TLT committee and was regularly seen as one of the front of house team on performance nights as well as being on hand to help with the many theatre projects over the years. Winnie will be remembered not only for everything mentioned above, but for being the kind, loving human being who always had time to spend with you and was always willing to ‘muck in’. She brought laughter and joy into the lives of so many and will be greatly missed. We are pleased to announce that Margaret Speakes won the GMDF 'Adjudicator's Discretionary Award' for "A comedy performance which demonstrated perfect timing and superb stage presence, whilst performing at Tyldesley Little Theatre " for her perfomance as Betty in TLT's proction of 'Curtain Up!' which was directed by Matt Walshaw. Margaret was also runner up for the award of 'Best Supporting Actress' for the same play. Well done Margaret, you deserve it . As a registered charity TLT has qualified for the 'Amazon-Smile' scheme. This means that when you shop, instead of going to the normal Amazon site you shop through the 'Amazon Smile' site. This means that a small percentage of your purchase price is paid back to TLT. It's not a lot (only 0.5%) but probably equal to the interest on many bank accounts!! It costs you nothing but a few minutes to initially set-up your details and then everytime you shop on Amazon, go through the Smile website and help us a little. To set-up just click on this link... https://smile.amazon.co.uk/ch/513123-0 which should open a new window in your browser. Then book mark the link and use every time. Simples! !